The trick to making the best hash brown potatoes is the same as for french fries. The potatoes must be dry when they hit the pan, otherwise, the surface starch absorbs the water and the surface isn't sealed, allowing the interior to absorb the grease. The second trick for crisp and tender hash brown potatoes is to make sure that the fat is hot when the potatoes hit the pan. Dry the grated potatoes very well using a kitchen towel. Then, don't even try to move the potatoes until the bottom is well browned, to avoid sticking. 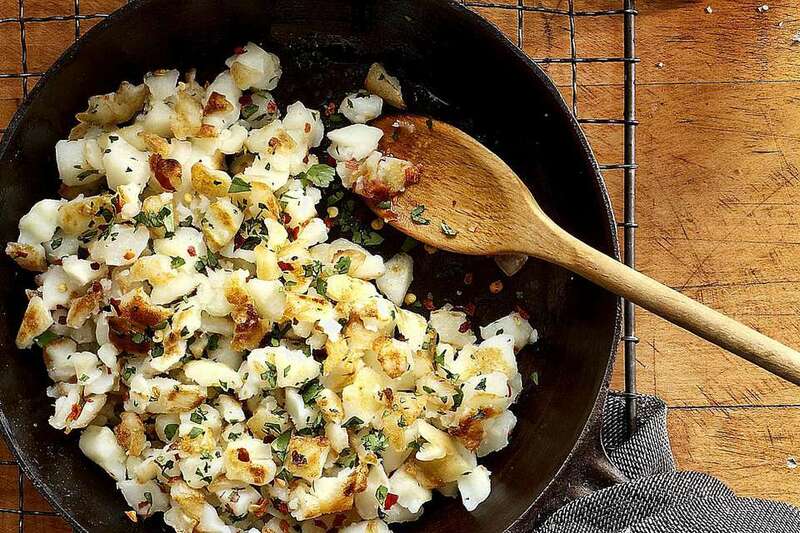 Russet, or high starch, potatoes make the best hash browns, but you can use Yukon Gold potatoes for a buttery flavor. Don't use red potatoes, since they don't have the right kind of starch to make hash browns that are crisp and tender. This fabulous recipe is perfect for a special brunch, or serve it with corned beef for St. Patrick's Day. It's also great with scrambled eggs and lots of crisp bacon, with orange juice and coffee on the side. Add some fresh fruit for the perfect breakfast. Peel the potatoes and grate them into a large bowl. Work quickly, since the potatoes will start changing color. Sprinkle the potatoes with some of the lemon juice as you work to help reduce the color change. When all of the potatoes are grated, dry the potatoes thoroughly by squeezing in a kitchen towel. You should have about 1-1/2 cups grated potatoes, loosely packed into measuring cups. Toss with garlic salt and pepper. Place half of the butter and half of the olive oil in a heavy large skillet and heat over medium heat until sizzling. Add the onion and cook for a few seconds over high heat, stirring constantly. When the onions are fragrant, add all of the potatoes and pack down with a spatula. Reduce the heat to medium and cook for 7 minutes, shaking the pan occasionally so the potatoes don't burn on the bottom. Then flip the hash browns onto a plate; add the remaining butter and olive oil to the pan and let it melt. Swirl the pan to evenly distribute the butter and olive oil. Carefully slide the hash brown cake back into the pan, uncooked side down, and cook for about 5 to 6 minutes longer, or until the bottom is crisp and golden brown. Serve immediately.